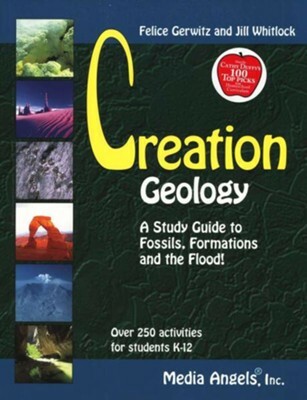 Creation Geology: A Study Guide to Fossils, Formations, and the Flood! Geology, fossils, and other portions of the earth history are magnificent reminders of the beauty and handiwork of God's creation. This unit study combines basic geology with creation science, language arts, science, geography, history, math reinforcements, vocabulary, spelling, reading lists, art, and more. The first portion of the book gives lectures/research for the teacher including explanations of geology and evidence for creation; outlines, reading lists, activity & experiment resource list, vocabulary & spelling lists and other subject suggestions are then presented by level. Grades are divided into levels K-3, 4-8, 9-12. Over 300activities are included! Some reproducibles, glossary, field trip log and science experiment chart included. 202 pages, softcover. For Grades K-12. I'm the author/artist and I want to review Creation Geology: A Study Guide to Fossils, Formations, and the Flood!.